When rigging weapons or hard surface meshes with specific angles or orientations, I want to be able to quickly create a bone with the same orient of a selected mesh component. I want to ensure I have as precise a position and orientation as possible. With the latest versions of Maya creating and manipulating pivots have become far easier with native tools. Though, I've yet to see a process to do exactly what I've been looking for. I've written a fairly simple script to achieve what I've found to be the most intuitive approach to creating a bone with the position and orientation that I desire. Here is a brief walk through of how I create bones using a custom pivot. The script I use can be found below. A friend of mine recently pointed out that you can change the default behavior of Maya's drag and drop files. I generally have not used this workflow but upon changing how it handles the open conditions, I have found drag and dropping far more useful recently. I have changed the local Maya file performFileDropAction.mel, from exclusively choosing to do a file import, to giving the user the options they wish to perform. The best implementation of this updated procedure would of course be to package the modified code into a module. This is a far more reasonable approach for distribution if you need to roll out to a team. If you need more information on this process, check out Steve Theodore's article on Maya modules. Here is a brief walk through of how the new behavior works & the updated code can be found below. In this post I will step over the process the artist will run through to get the assets ready for game. 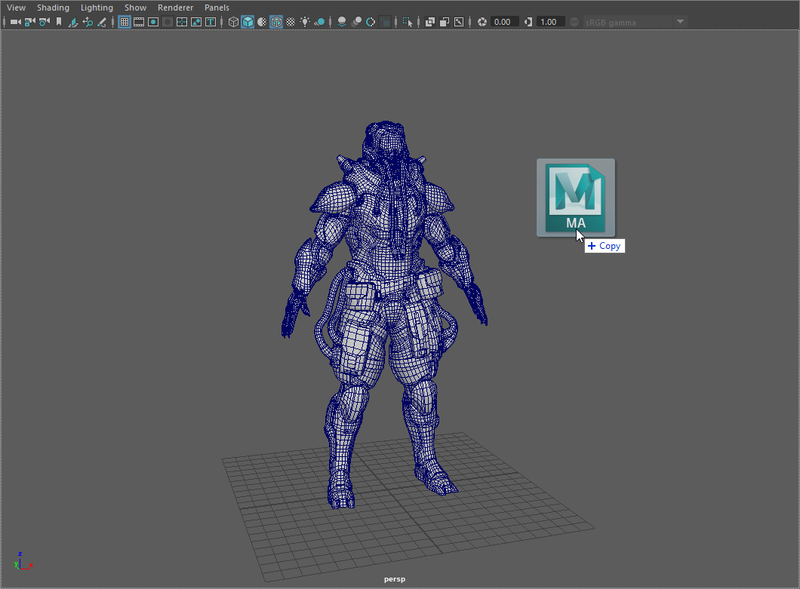 The artists can import the mesh from any DCC they choose to create the assets within. The setup process itself is handled entirely in Maya. We need to first import the artist created meshes into a clean Maya scene. As mentioned previously the clothing is created for specific sections of the character. In this scene we have a shirt/upperbody and pants/lowerbody. The artist runs the Customization Builder tool, selects the mesh and plugs the selection into the gender specific field. This field is used to determine which rig/skinned mesh the item will be constructed upon. 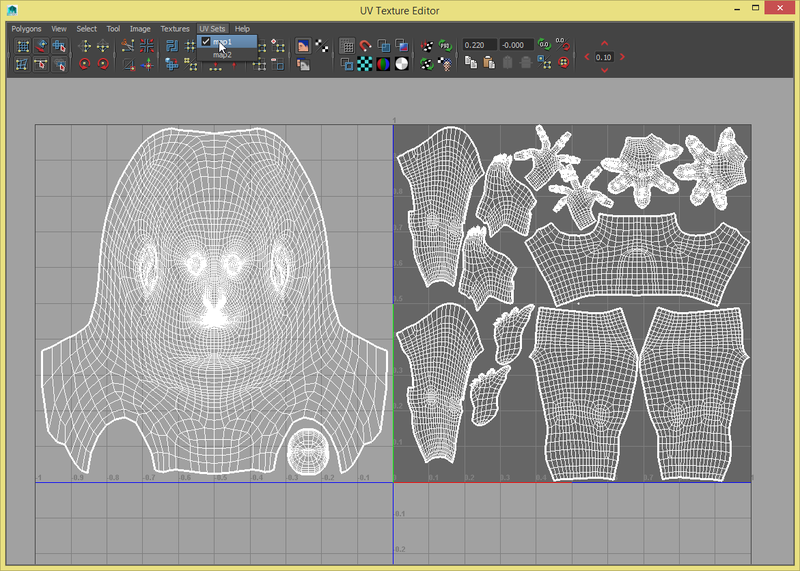 Upon assigning the mesh it is evaluated for poly count, number of uv channels and number of material assignments. 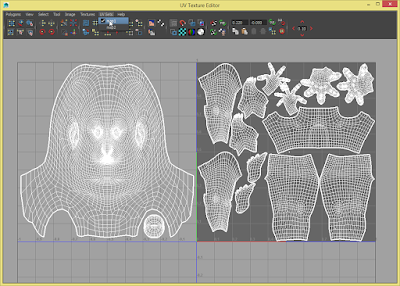 It also makes sure the transforms are correct on the mesh before attempting to bind to a skeleton. 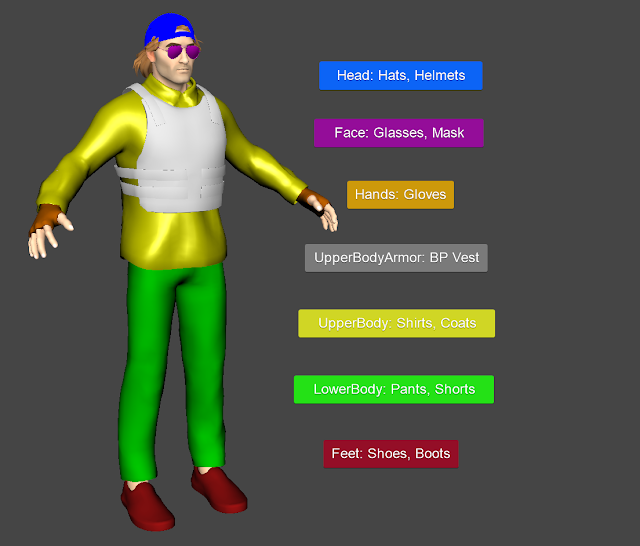 Next we set a unique item name and then we assign the body slot/section for the clothing item. This will rename the mesh accordingly, create an export hierarchy and apply attributes to the groups and meshes used to rig and export the item. These attributes assist the tool when opened later and will also inform the export process how to handle the current asset. In this stage we import a clean skinned base body mesh. We locate the flagged gender specific body mesh that was imported and copy the skinweights from the body to the clothing mesh. Additionally, the skinweights and bones are pruned based on the body part chosen, to use the least required amount possible. It's important to note that I am not referencing the base body mesh here. While there are benefits to references they don't apply very well here. If I update the body mesh or skeleton, I want to know how to propagate those changes to the meshes in the customization files. If I allow referencing to just update naturally I cannot control the changes. After opening an existing customization file a callback will check the local mesh/rig version and compare to the latest one in the depot. I use the version numbers to inform how to process any updates. Some updates happen without user intervention while others require notification. The callback code for the tool also has versioning so I can run code specific to the version number where applicable. Once the scene version is up to date I can tick the local version attributes to the proper index. 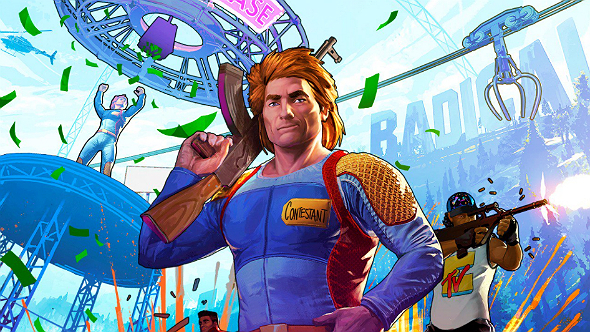 Major: This requires a complete replacement of the rig in the scene & skin copy update. Minor: The tool can update specific aspects of the mesh/rig without requiring a full update. 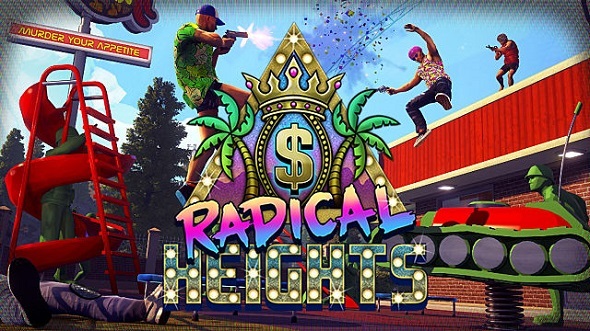 Patch: These small changes can generally be ignored and likely require no updates. 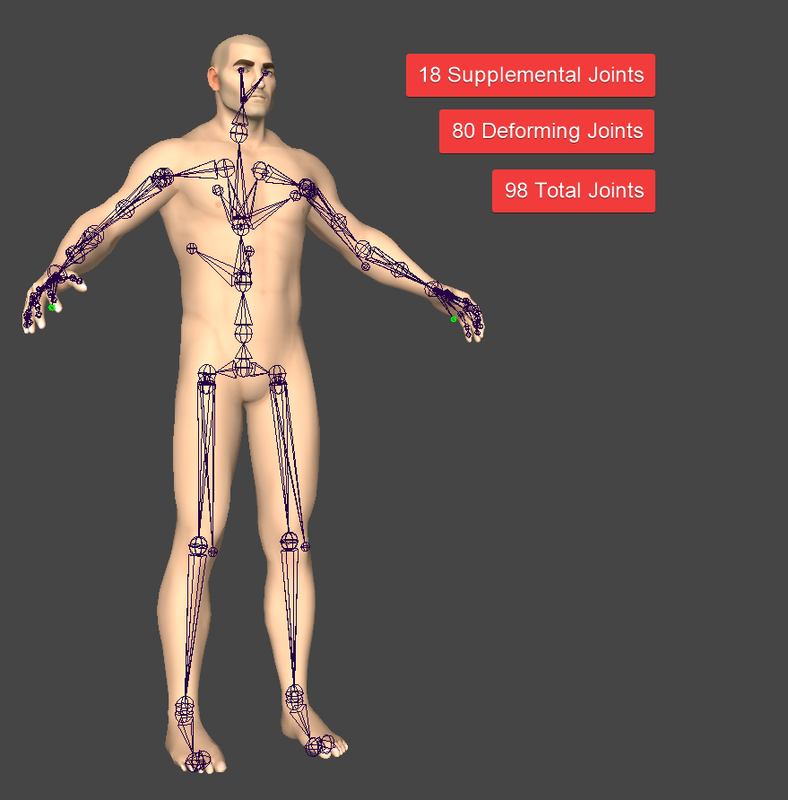 The artist can optionally import the skeleton range of motion to check how the skinning worked out. A rom skeleton with baked animation is imported into the scene and the scene skeleton is constrained to the that skeleton. The artist can then apply some quick skinning fixes to the mesh or let the Character TD address any issues later in a polish pass. Once everything looks good to go we can move forward with exporting the item. As was mentioned before the exporter handles all of the file naming and determines where to export relative to the project and the item slot. The file must also be saved and added to the depot in a proper location before exporting will occur. This ensures an artist that is putting assets into game will have the source file available as well. On export the item FBX file is written out, a post-process is run on the FBX file to remove unnecessary nodes and correct the hierarchy where needed. A thumbnail is generated for our asset tool and all of the files are checked out and/or added to perforce automatically. Below is a video showing how easy the entire process is for the artist setting up the asset for use in game. The artist can further edit the existing meshes or update with another internal tool that will preserve all of the settings and replace the mesh, uv's, etc, all with updated skinning as needed. RandallHess - Customization Builder from Randall Hess on Vimeo. In the next and final part I will go over how the customization items are implemented in game using Unreal Engine 4. For Lawbreakers we had a juggernaut class that featured two bipedal robots. The robots had a shared base skeleton hierarchy for animation purposes. However, they had custom joints to handle the visual differences in their armor and armor plating. In most cases the base bipedal skeleton worked just fine, but there were issues when the mechanical mesh joint visual pivots and the actual skeleton joints were inconsistent. We had a couple levels of customization and we had to make sure the joints were modeled consistently to make sure they would work with the rig and animation properly. In the video below, I go over a process on how to correct the meshes for these issues specifically on the fingers joints. Fixing Mechanical Joints for Rigging from Randall Hess on Vimeo. The only thing missing in the video is the clean up of the temporary joints and freezing the mesh to preserve its new modified transform. Once that is done, you can bind the meshes back to the original skeletal hierarchy.